So on the way to Wade's game, I stopped in Sioux Falls to pick up our son, Mitch. Mitch is now taking a photography class. So I suggested that we spend some time at Sertoma Butterfly House. Mitch has always scoffed at the idea of the Butterfly house. He has made fun of me for wanting to go. It does not stop me from going but still...so we went...and had a great time. The SBH in Sioux Falls is awesome. And we had the place pretty much to ourselves. Tons of butterflies and helpful volunteers. 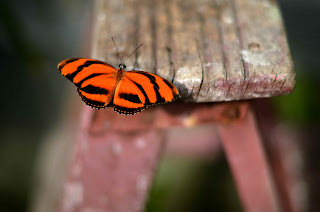 I liked this photo because of the stool and the orange colors. Thanks for going with me this time, Mitch.